The Window Shop Jewelers is an experience. We are dedicated to fulfilling our customers’ dreams and to providing objects of consummate beauty and lasting value. Shop here for fine jewelry or timepieces, famous collections, exciting new designers and lines waiting to be discovered. Proprietor Jean McNeill and staff personally guide visitors through a breadth of selections…karat gold and sterling…diamonds, precious and semiprecious stones, pearls, vintage and contemporary pieces and more…jewelry for virtually every occasion…and every price point. We also provide appraisal information for any of your fine jewelry or watches by a Certified Gemologist. So, if you ever find yourself strolling along Main Street, we highly suggest that you make a visit to one of Northport Village’s number one retail staples. We offer more than just our jewelry and repairs experience our commitment to personal service. 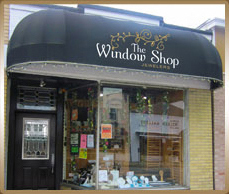 The Window Shop is fully handicap accessible. 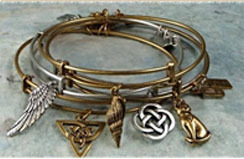 Wind & Fire Jewelry elevates the art of eco-sustainable jewelry to new heights. Made in the USA from recycled brass, our jewelry collections are finished with antique gold or antique silver. Not sure what to give to that special person? 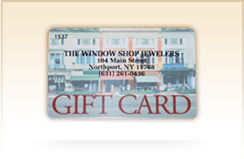 The Window Shop has gift cards that are perfect for any occasion!